Naturalist and wildlife photographer Stan Tekiela observes hundreds of Tundra Swans as they migrate to their nesting areas. Stepping out of the house, I immediately hear a familiar and wonderful sound—one that I only hear at this time of year. It is a high-pitched and smooth bugling call, given over and over. The sound is always distant and comes from high up in the sky. If you don’t stop and look up and around, you just might miss it. It is the sound of hundreds of migrating Tundra Swans (Cygnus columbianus). Each autumn, thousands of these pure-white waterfowl migrate out of their nesting areas in northern Canada and Alaska and make an amazing journey across the country. Migrating flocks number in the hundreds to thousands and consist of immediate and extended family members. They are usually broken up into smaller groups, ranging anywhere from 20 to 200 swans. They fly in large V formations. Over the past couple of weeks I have been seeing and hearing dozens of flocks flying overhead. They are all flying in the same direction, from the northwest to the southeast. Usually they are migrating only on days when the wind is blowing out of the north or northwest. 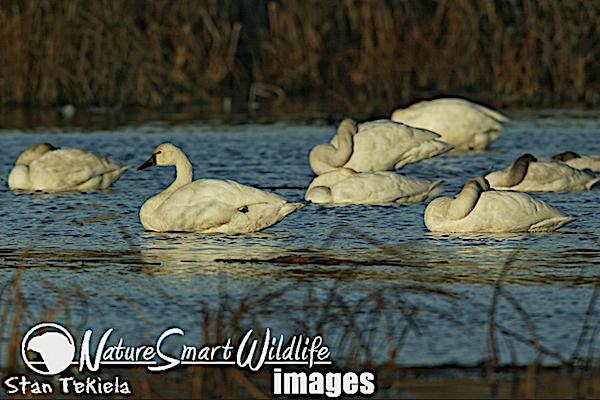 Formally called Whistling Swans, the Tundra Swan is pure white with black legs, feet, and beak. However, when these birds feed on the bottoms of iron-rich ponds and lakes, the feathers on their heads and upper neck become stained a reddish color. They are incredibly large birds, weighing up to 16.5 pounds and having a 5- to 6-foot wing span. They look nearly identical to our slightly larger native, the Trumpeter Swan. The best way to separate the two species is by their call. The Tundra has a high-pitched call and the Trumpeter has a low-pitched call. The other is by looking just below their eyes near the base of their bill. The Tundra Swan has a small yellow patch and the Trumpeter doesn’t, but this is often very hard to see. There are two populations of Tundra Swans. Both nest in the arctic of northern Canada and Alaska, but the western population migrates to winter mainly in California. The eastern population, which is the majority, migrates diagonally across Canada and the eastern half of the U.S. to the Chesapeake Bay in Maryland and along the coast of North Carolina. They fly an incredible 4,200 miles one way to spend the winter. While migrating, the eastern flock has several major stop-over sites. One of these is the backwaters of the Mississippi River between southeastern Minnesota and western Wisconsin. In the shallow ponds and slow moving parts of the river, thousands of Tundra Swans gather to feed and rest. The other day I traveled to see these amazing migrating birds along the Mississippi River. Even though the temperatures had been well below freezing for several weeks, parts of the water along the Mississippi River were still open. Just off the west shore of the river, in a short (1-mile) stretch of the river, thousands of Tundra Swans were gathered. These were the very swans that had flown over my house four or five days before. I stopped at a curve in the road that gave me a good view over the river. The moment I opened my truck door I could hear my old friends calling. The sweet sound of the Tundra Swans. Thousands of birds were feeding, resting, and calling. The blue sky reflected on the water’s surface, making the white swans stand out like neon lights. I spent the rest of the afternoon observing and capturing some wonderful images. I was able to watch as families of swans interacted with others. Some swans where flying, while others were sleeping or feeding. But all along, they never stopped calling. They will spend perhaps another week or two feeding and resting before they will start to take off and continue on their journey to the east coast. In the spring they will fly up the east coast until they hit Canada; then they will turn westward and fly across Canada back to their nesting grounds. I won’t see the swans for another year.